The third building to fall at free fall speed on September 11, 2001, was WTC7. It was not hit by a plane on 9/11 and yet imploded on itself at free fall speed like the other two towers, meaning that there was no resistance to its collapse, indicating a perfect demolition job by experts. The building’s collapse was mistakenly reported by the media ahead of time, at a time when news channels were all clambering over themselves to read from the same hymn sheet. The BBC managed to announce the collapse of the building before it happened, adding to the confusion of the day. Fifteen years later, empirical evidence and the laws of physics are still being ignored while millions have lost their lives and the world is on the brink of war. 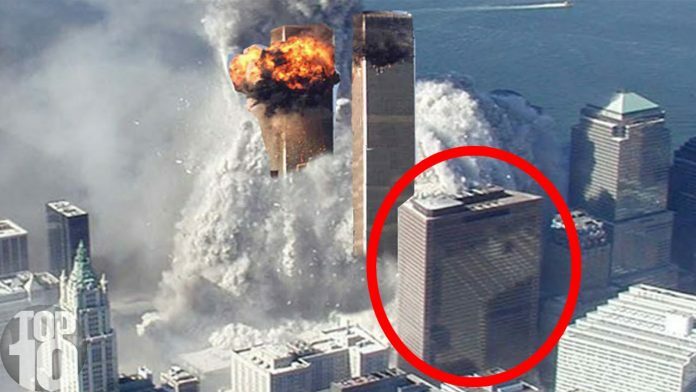 The third building was not even mentioned in the official 9/11 report. 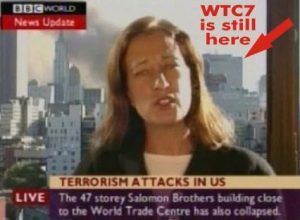 WTC7 housed a command center and other important offices. An alarm was sounded for rescue workers to evacuate the area prior to its collapse.